Farms and farm animals are an enduring theme with children, and we've got a great collection of farm colouring pages of all sorts, to appeal to all age groups up from the very youngest children. Just scroll down to find what you want - we've got everything from ducks to tractors and lots of different styles - then print and enjoy! This simple printable billy goat colouring page is aimed at younger kids, with its name written underneath the picture. Great for farmyard fans! Here's a simple colouring page of a pretty calf, part of our set of cow and cow shed colouring pages. This kitty cat colouring page is perfect for the youngest kids, with its size, big bold lines and cute face. Here's a fun chicken colouring page - perfect for younger children with its bold lines and size. It's part of a set of similar farmyard printables. Here's a printable chicken colouring page with simple outlines and the word underneath the picture for younger children. Here's a fun chicken which needs to be finished off by the children, who can trace over the dotted lines before colouring it in. Great for practising pencil control! Colour in our cute cow and calf picture to remember a trip to a farm or as part of a project. Perhaps you could add a field of grass around them for them to graze. Here's a nicely detailed cow and cowshed colouring page, a fun addition to a farm or homes project. Here's a simple, fun cow colouring page for younger kids. Here's a stately cow colouring page for younger children to colour, complete with letters spelling out the word underneath the picture - great for early readers. A cow and calf shelter in a cow shed in this delightful cow scene colouring page. 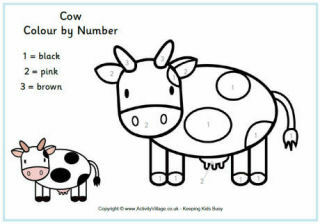 Print out this lovely farmyard scene of a cow and her calf ready for the kids to colour in. D is for Dog on this colouring page. He looks like he could get up to some mischief! If you think he's cute, print out the matching colour poster, it's part of a complete alphabet set. Can you make our sheep dog a colourful home on our dog and kennel colouring page? There is lots of space to write on this dog and puppy colouring page making it a useful addition to a project on dogs or pets. Colour in the pictures and add notes around the outside. This gorgeous puppy dog colouring page is perfect for the youngest children, with its big bold lines and cheeky face! A beautifully crafted kennel for a child to colour in amazing colours. Solve the simple sums and then use the key to colour in this cute picture of a dog...fun for little kids! Have fun colouring these dogs lying in the kennel with a bone and bucket of water nearby. Woof woof! A home coloured card is a lovely surprise and this cute scene with a mother dog and her puppy is perfect for dog lovers to receive on any occasion! Simply print, colour and fold in half. Here's a colouring page for younger children with a charming donkey drawn with big bold lines! Print, fold and colour this lovely donkey scene colouring card, then give it to someone as a special surprise! Here's a lovely colouring scene featuring two adorable donkeys - perfect for a farmyard theme! I think the duckling on our duck and duckling colouring looks more than a little mischievous. Enjoy colouring this cute duckling and his patient mother. I love how the duck and duckling look at each other so fondly on the pond. Get out the colouring pencils and enjoy colouring our duck and pond colouring page. A pretty foal for kids to colour in! This could be a great activity for when you get home from feeding the birds at your local pond. G is for Goose on this colouring page and it is part of a complete alphabet set. Here's a bright, fun goat colouring page for younger kids, with big bold lines and a cheeky face! Here is a simple outline goat colouring page for younger children, with the word underneath the picture for early readers. Here's a realistic goat colouring page to print and enjoy. Get the kids to colour in this cute goat scene card for someone special! Just fold the card in half when you are done and you have an extra special greetings card to give. The children will love this colouring page featuring a goat and two very cute kids! Watching chicks hatch is an activity loved by children. Even if you can't watch them yourselves you can colour our lovely hen and chick colouring page. This lovely colouring page features a hen and henhouse to colour. Pony fans will love our horse and foal colouring page. Why not draw in a background? We know there are a lot of horse lovers out there. Here's another colouring page for them. This one features an elegant horse and their stable. This is a very large, big, bold and cute cartoon horse colouring page - specially designed to appeal to younger kids! Grab your coloured pens or crayons and colour in the lovely horse on this colouring page. For horse fans, this is one of a collection of horse colouring pages available at Activity Village. This one is perfect for younger children, with letters spelling out horse underneath the picture. Here's a pretty horse colouring page to print for the kids to enjoy. Here's a simple outline picture of a horse grazing, good for younger children. We've included the word underneath the picture. The cute horse in this simple colouring page is all saddled up and ready to go! I think that this horse is enjoying jumping over the hurdle! It's a lovely simple horse colouring page for younger children. Here's a lovely, simple, prancing horse for kids to colour in! There's a really lovely horse hidden in this worksheet, and all the children need to do to find it is to solve some simple sums and then colour in the picture using the key on the sheet. We have two versions available - one UK and one US. This lovely card will appeal to all horse-riding fans, especially if someone colours it in carefully! The colouring picture sits against a pretty green striped background. When you've coloured it in, just fold in half for a special card. Here's a horse stable to be coloured in for a pretty picture. Here's a lovely colouring page for anyone who loves horses - and remember to colour in the horseshoes too! Kids that like cats will enjoy this sweet colouring page featuring three little kittens, playing and enjoying each others' company. Our cute little lamb colouring page with word underneath is just one of a set of similar farm animal colouring pages at Activity Village. Perfect for spring time colouring! Here's a woolly lamb for your child to colour. Add some lambs to this countryside picture - for Easter, for spring, or for a farm topic, perhaps. Here's a simple, fun ox colouring page for younger kids, perfect for Chinese New Year or a Nativity stable scene. If you need an ox, we've got an ox colouring page here! With the word underneath the picture and a realistic outline illustration, it's particularly suitable for younger children. Here's an majestic ox colouring page for kids to print and colour. Useful for Chinese New Year. Colour in this cute picture of a bull or ox, but only when each little sum has been solved to give the correct colour! Will you colour your pig and piglet all clean and pink or will you add a bit of squelchy brown mud? Our pig and sty colouring page shows the pigs playing in the mud of their enclosure. You might not be able to colour in this lovely pig's curly tail, but you can enjoy colouring in the rest of him. Here's a picture of a very happy pig for the kids to enjoy colouring in! Grab some felt tip pens or coloured pencils and colour in this lovely piggy! Which colours will the children choose to colour in this cute pig I wonder? The kids will love this cute, happy pig, waiting to be coloured in! Oink Oink! Can the children grab their crayons and colour in this cute pig? This cheerful little pig is just crying out to be coloured in - but first the kids need to solve the simple sums to work out which colour to use in each section. Here's a lovely pig scene to be coloured in - a mother pig enjoying the day with her baby piglets! Here's a cute piglet for some colouring fun. This colouring page full of funny pigs is bound to put a smile on anyone's face! Especially the pig sat on top of another pig (giving him a piggyback?)! Here's a lovely colouring page of two pigs enjoying some mud - perfect if you're studying farm animals, or just for fun! I just love this pretty pony colouring page, and I hope the kids do too! We've done two versions, one with word and one without. Colour in this pretty pony, who sits against a background of little pink hearts, then fold in half to make a lovely card for a special friend or family member. This lovely pony colouring page has a background pop of colour that makes the picture really stand out and makes it extra fun to colour in! Colour in this picture of a princess and her puppy! Three cute puppies play together in this sweet colouring page for kids. Here's a fun colouring page of a playful puppy to print and enjoy with the children. Here's a simple outline of a farm rooster to print and colour, great for younger children with the word below the picture. Every farm yard colouring set needs a rooster colouring page! Print out this proud cockerel for the kids to colour in. This proud looking rooster would make a lovely "well done" card or perhaps to wish someone happy Chinese New Year of the Rooster! This proud rooster is full of detail to colour, perfect for Chinese New Year or any time. Here's a fun way to colour in a rooster - perhaps for a farmyard or Chinese New Year theme. Just get the kids to solve the sums and then follow our key to choose the correct colours for each space on the colouring picture. Our sheep and barn poster freatures a tradition barn that is usually red. What colour will you colour it? Are you going on a farm visit to see the newborn lambs? Our sheep and lamb colouring page is a lovely way to remeber a day out. Here's a lovely big sheep colouring page for the youngest children, with big bold lines and a pretty smile! Here's a simple realistic sheep colouring page to print for kids to enjoy. Whether you want a black sheep or a white sheep or something in between, we've got a sheep colouring page here which is great for younger children. We've added the word underneath the picture for early readers. Prihis pretty sheep scene colouring card out onto card then colour in before folding in half. Done! Use your printer's borderless settings if you can. A spring scene with a sheep and lamb for children to print and colour. Here's a lovely rustic scene, with mother sheep and lamb, for children to colour in. Here's a lovely shaggy sheepdog colouring page to print and enjoy - just one of our farm animal colouring pages. Have fun colouring this cute sheepdog puppy - he looks so cuddly, doesn't he? Here's a stable for your child to colour. Now all you need is a horse to live in it! Here's a lovely colouring page of a trotting horse. It has been beautifully groomed and is nicely turned out - perhaps it is on parade?